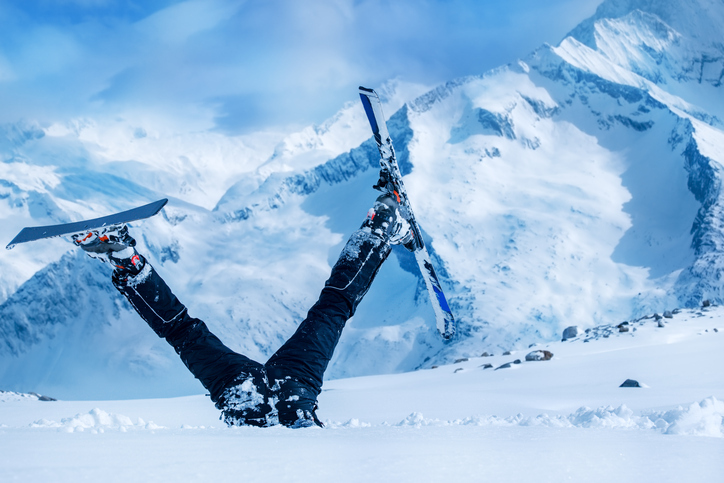 It looks like this skier has taken a tumble! To tumble means ‘to fall helplessly,’ ‘to roll end over end or flow over,’ or ‘to roll about.’ Figuratively, it means ‘to decline’ or ‘to fall suddenly from an authority position.’ It also means ‘to fall into ruins.’ Informally, usually with an adverb, it means ‘to come or go in a fast, disorganized way.’ As a noun, a tumble is the act of tumbling, an accidental fall, a drop in value, and a fall from an authority position. The man slipped and tumbled down the hill. The waterfall tumbled over the rocks. The clothes were tumbling in the dryer. The politician tumbled from power. Buildings have tumbled in the earthquake zone. People came tumbling out of the blazing building's exits. The cyclist swerved hard to avoid the dog and took a tumble. There has been a tumble in this company's share price following the scandal. Tumble dates back to the late 13th century. The Middle English verb tum(b)len meant ‘to dance in an acrobatic style,’ and also ‘to fall down,’ and was a frequentative (on other words, it describes repetitive movements) of the Middle English verb tomben, from the Old English tumbian (meaning to dance, tumble or leap). While the origin is unknown, linguists believe it is Germanic, and it is related to the Old Norse tumba, the Dutch tuimelen (to tumble), the Low German tummeln and Middle Low German tummelen (meaning to turn or dance), and the Old High German tūmōn and German taumeln “(o turn or reel). The transitive sense, ‘to cause something or someone to tumble’ dates back to the 14th century. The noun comes from the verb. When it first appeared in the mid-17th century, it meant ‘confusion or disorder,’ but the meaning we know today, ‘a fall, usually accidental,’ dates back to the early 18th century.